For a girl who loves makeup like me,skin is very,very important.It’s true when they say your skin is like a canvas for you to paint.Yeah,in that case my canvas in not so clean,meaning i have blemishes,spots,red bum,acne and thanks to my skin condition I have to go and see my dermatologist every month.I tried not to make my skin scar cos it takes years for it to disappear.Well I’m on medication now and the acne is controllable,so i start using makeup again.It’s very frustrating when what ever I used my skin still looks horrible (makeup should make you feel,be & look beautiful). I came across hada labo in guardian pharmacy.Hada Labo is a skincare range from Japan but I set my eye on this one product only.So I started my research on this product.And the magazines in Malaysia kinda play big part in my hada labo discovery too.I read about it in cleo,women’s weekly ,female and there are blogs who wrote review about super hyaluronic acid moisturizing lotion.But what makes me really want to try this product on is all of review mention how it makes your makeup easy to apply and makes skin looks nice.Definitely worth trying for me. I got my first hada labo from guardian pharmacy,and i bought their foaming wash and got the super hyaluronic acid moisturizing lotion sample which comes in small bottle I thinks it’s 30 ml.I totally love that super hyaluronic acid moisturizing lotion the first time I used it.But it takes time for your skin to absorb.I usually pat or rub it into my skin,after it dries off then only i start doing my makeup. 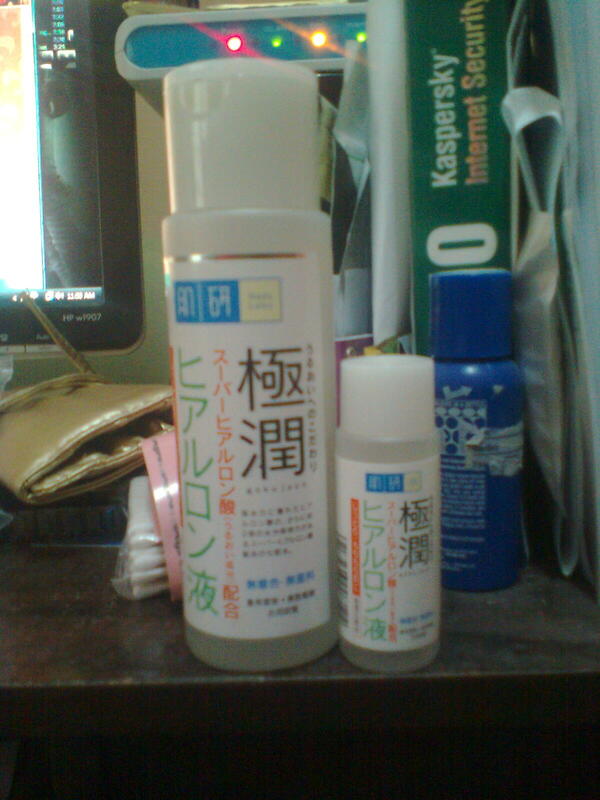 I’ve finished the small bottle of super hyaluronic acid moisturizing lotion.Now I bought the big bottle which cost me about rm40++ after discount and I’ve already used half of it.I used it every day without fail.I think guardian is having promotion for super hyaluronic acid moisturizing lotion now.So I’m going to buy one to keep in case this finish. Are you using hada labo? This entry was posted in beauty, christmas, makeup, shoppaholic, shopping and tagged Acne, chicks, hada labo, makeup, skincare, super hyaluronic acid moisturizing lotion. Bookmark the permalink.